Why can’t I print from Reckon Accounts Hosted, since the latest update mid-January 2018, with Adobe as my PDF reader? We did a major update on Reckon Accounts Hosted infrastructure to improve the clicks required for printing. We have reduced the number of clicks required for you to print your documents including purchase orders, reports, payslips, invoices and more. This means you can now print faster with just 3 clicks. However, for Internet Explorer users who have Adobe as their PDF reader experienced an issue of not being able to print from Reckon Accounts Hosted. The print button does not seem to send the Print command to the local printer, although the user gets the message that it is printing. This is applicable to the users using Reckon Accounts Hosted in Internet Explorer with Adobe as a preferred PDF reader. NOTE: This issue only happens when using Adobe PDF reader in Internet Explorer, users have the option to use another PDF reader or other browsers. We recommend using Google Chrome. PDF reader Internet add-ons interact differently with a different browser. With Internet Explorer, users must disable the Adobe PDF reader ActiveX control. 1) Go to tools icon (cog-wheel) on the top right corner of the Internet Explorer. 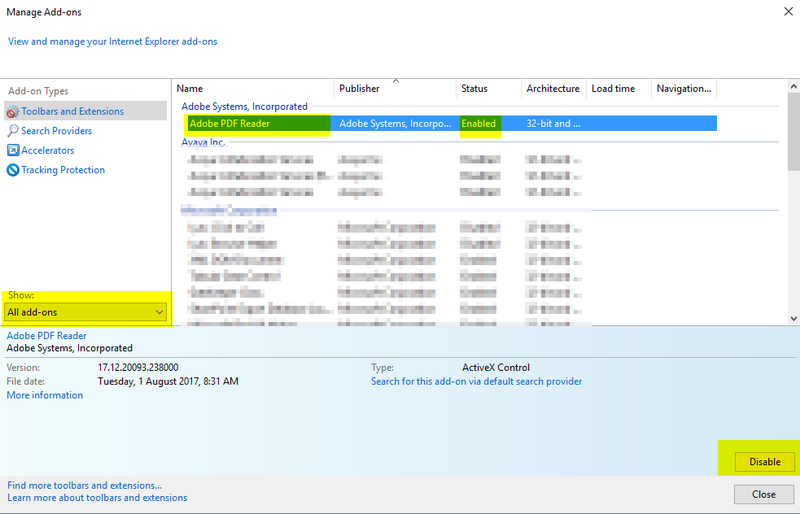 2) Select Manage Add-ons. Or go to Internet Options -> Programs Tab and select Manage Add-ons. 4) Select Adobe PDF reader from the list on the right. 5) Select Disable in the Bottom right corner of the window. 6) Close and out of the window. 7) Now try printing. The message will appear again, “This document is trying to print. Do you want to allow this”. 8) Clicking YES > Prints the transaction directly to your default printer and also opens in PDF. If it does not print but prompts you to open the PDF file, check if you have selected your printer as the default printer, under devices and printers setting under control panel. If not please make it default printer.